After an official ground-breaking ceremony on July 14, the main islands in all four quadrants of RMB City completed terraformation (shaping of topography), and foundations were laid for key urban structures. 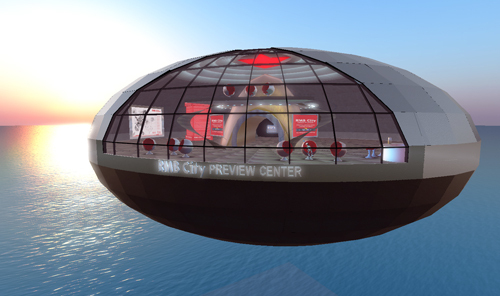 Now we are proud to announce the opening of the Preview Center, a specially-designed floating building, where the public can peer through the windows to view the ever-changing RMB City construction site beyond. 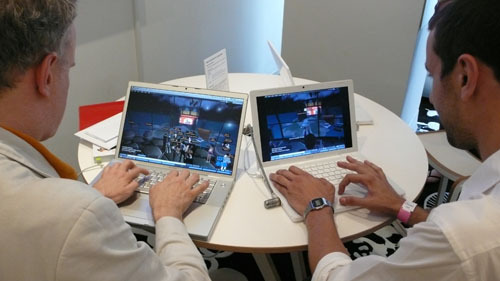 Visitors may also learn more about the city through videos, photos, text, and even free gifts. Each week, a new construction-montage video will be added here, to give a “closer look” to the ongoing process. 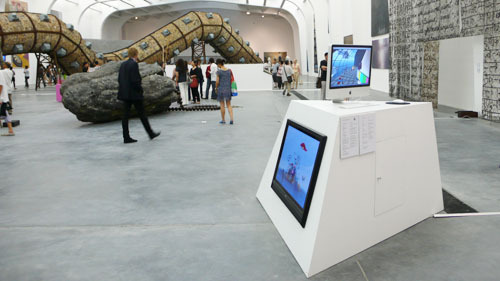 To coincide with the opening of the Preview Center, the Serpentine Gallery in London launches its real-life (RL) presentation of the project in a dedicated gallery space on July 25. Like to know more about RMB City? 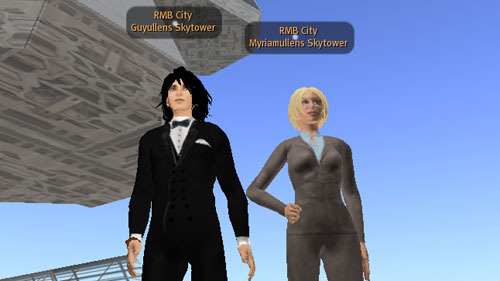 We welcome you to join the “RMB City group”, to keep informed about your city in Second Life as it continues to grow and change. 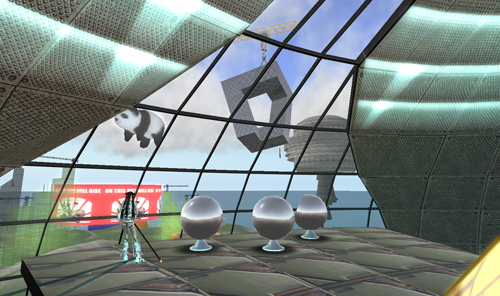 Beijing-based artist Cao Fei (born 1978) is fusing fantasy with the contemporary Chinese city in her construction of RMB City, an experimental art community in the internet-based virtual world of Second Life. 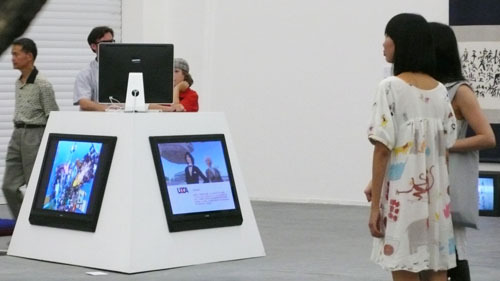 Cao Fei, through her Second Life avatar ‘China Tracy’, spent a year exploring the possibilities of Second Life and produced the i.Mirror trilogy, 2007, a series of films that document her adventures, which were presented in the Chinese Pavilion at the 52nd Venice Biennale, 2007. 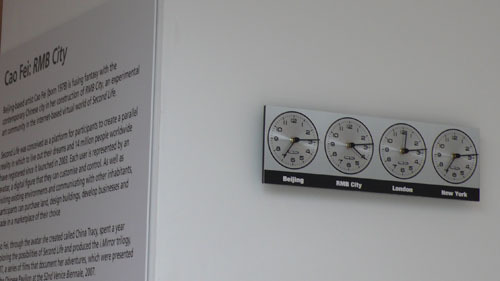 The Serpentine has commissioned the artist to present RMB City in the Gallery’s public space and to continue her investigation of this digital landscape and the development of RMB City. 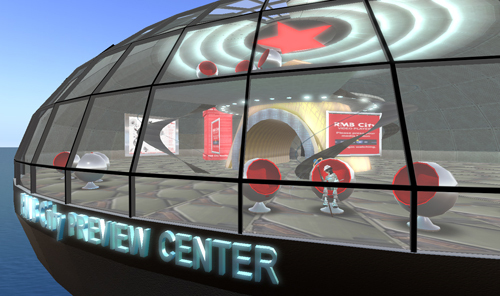 Once she has completed its construction in autumn 2008, the buildings of the virtual city will be occupied for two years by partners including institutions and individual collectors who will host exhibitions and cultural activities open to all Second Life users. The project explores the creative potential of an online art community, seeking to create the conditions for an expansive discourse about art, urbanism, economy, imagination and freedom. Throughout the ‘construction process’ and actual operation period, the Gallery will show the progress of RMB City in its lobby and on its website. Reflecting on China’s recent urban and cultural explosion, the architecture of RMB City is an amalgam of Chinese icons, ancient and modern, from the panda to the Beijing National Stadium for the 2008 Summer Olympics. 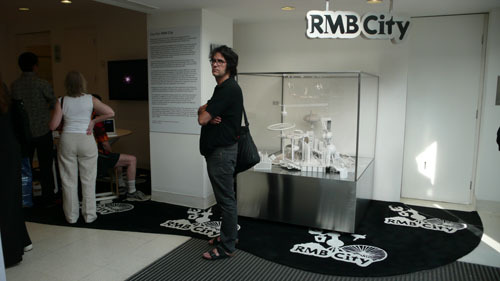 The installation in the Gallery’s lobby presents two- and three-dimensional visualisations of RMB City as well as computer access to a virtual viewing platform over the construction site, which features weekly video updates of the construction process. 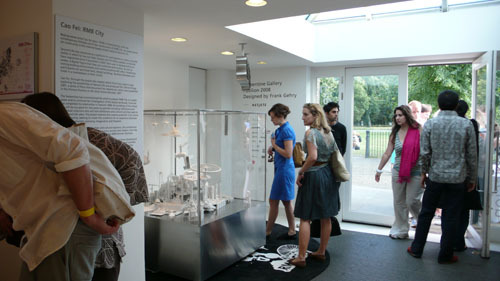 The public can also access the virtual city via the Serpentine Gallery website www.serpentinegallery.org and the project’s website www.rmbcity.com. Ultimately, this experimental online Utopia seeks to create the conditions for an expansive discourse about art, urbanism, economy, imagination, and freedom; in other words, the virtuality that forms our contemporary reality. UCCA will display a significant selection of the contemporary pieces from the Ullens Foundation collection, in an exhibition called Our Future: The Guy & Myriam Ullens Foundation Collection. Cao Fei is one of the six newly commissioned artists (among a total of 60), and will develop her RMB City project in Second Life. 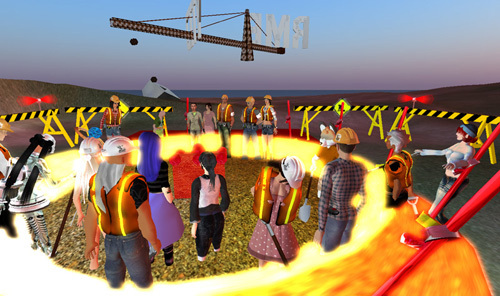 The official ground-breaking ceremony to launch the construction of RMB City took place on Monday July 14, 2008,on the future site of RMB City in Second Life. 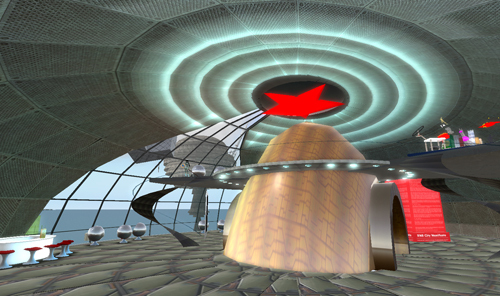 The masters of ceremonies were Miniature Tigerpaw, project manager of RMB City, and Chenin Anabuki the founder and project manager of Avatrian, a Metaverse Development Company. The key speakers were China Tracy, Chief Developer of RMB City, and Freeway Mayo, CEO of RMB City, who each said a few words about their great hopes for this historic project. After the speeches concluded, the more than a dozen attendants shared a champagne toast and gathered in a circle for the honorary ground-breaking. All team members were given customized RMB City shovels, and China Tracy was invited to turn over the first piece of sod for the new city. 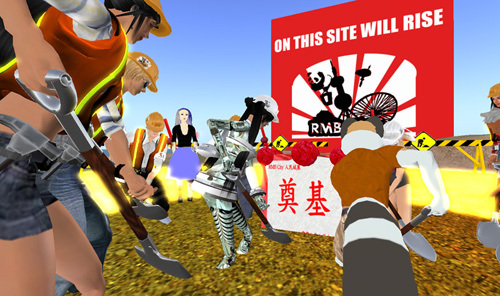 After the rest of the team joined in to dig together, RMB City was proclaimed officially under construction-laying a joyous foundation for the city to come.